very nice. and is that hunger games fan art I see for your profile pic? Wish i could draw like this! Its amazing! you know how to catch the character's likeness, it's amazing! These are really good. They are even better than the animated ones that actually came out in Japan XD. Keep up the good work! I wish I could achieve this kind of style. I love your lineart and the way you outline the most important things. Also the way you did Dean's nose and Castiel's brow are great. YUUUUUUUUUUUUUUUUUS!!!! OMG I LOVE BOBBY! Awesome! I love your style and the way you've captured their expressions. How long did you take in each one? This is SO good! I love pretty much everything you do, thanks for sharing your wonderful art!! 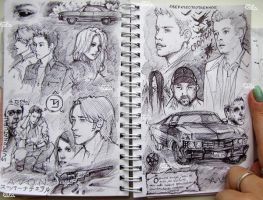 If you ever feel like drawing more supernatural I'll be beyond happy but you obviously don't have to!! Thank you! Great sketches you really expressed the characters so well. I love your style. The meld of realism and cartoon-ism is perfect! Where did you learn to art?! Over a year ago I actually learned to draw these characters from the sketches here. You've done a great job here capturing their individual characters in the eyes. Holy crap -these are just amazing! these are really good! I love Sam and dean especially, and the profile of Cas... and Bobby... and, you know, all of it. Wow ! Those are great ! Epic. I like, definitely. Thumbs up from me. This is BEASTY. I tip my hat to you. I really like these, they have a really nice style and you managed to make them look exactly like the characters despite them being cartoony. Wow! It really looks just like them! God I love Jensen so much it hurts.